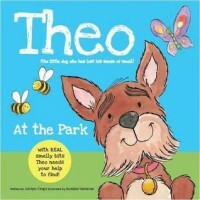 Theo at the Park by Jaclyn Crupi,follows the adventures of Theo on a quest to get his sense of smell back. He cannot figure out why he is not able to smell anything. Theo begins to ponder about the places that his sense of smell could be hiding. Could he have possibly left it at the park? Eagerly, Theo races to the park to begin his quest. He attempts to sniff various things throughout the area, but is still not able to smell a single thing. Feeling tired from his quest, Theo heads home. Perhaps his sense of smell is waiting for him there. Will he ever be able to smell again? I really enjoyed reading this story. I fell in love with Theo from the very start (I also own a Chihuahua named Theo)! Aurelia Verdoux's illustrations are adorable and fun. What I found to be truly unique is that some of the pages of the book are actually scented and not with the old school scratch and sniff stickers. I would love to know how they do that! While I liked the storyline and characters, I did not care for the way that the book abruptly ended. Nothing was resolved and there is no closure for the reader. I did discover that there is another book entitled "Theo at the Beach." My belief is that Crupi was attempting to turn the book into a series focused on Theo's continuing search for his sense of smell. Sadly, I did not feel that the ending of the book lent itself to a follow-up story. 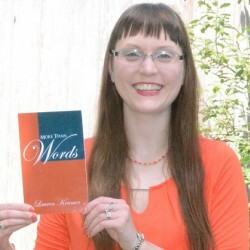 Overall, I found this book to be a great read for children ages 4-7.